Google Play Service Not working? If you download Journey Windows from our in-store page, please follow the steps below. Please note that internet connection is required during the app update. 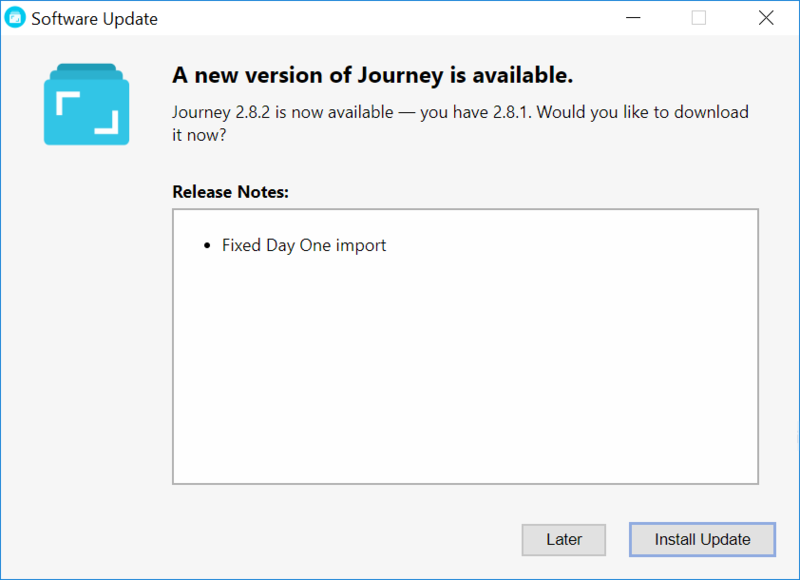 When Journey detects that you are using an older version, it will prompt for a software update. You can also update the app manually in Settings > Support > Check for Update. The software update dialog shows a list of new features available in the version. Click Install Update button to proceed with the app update. The download is in progress. Once the download has completed, the app closes and reopens again to finish the installation. The app is updated successfully. If the download is taking too long, you can download the latest .exe (32 bit or 64 bit) file in this webpage. Install the package to override the existing app. You do not need to re-sync your journal data. Please temporarily turn off any anti-virus and firewall software before updating the app.